Winston-Salem State University had the longest trip to make of any of the seven teams that qualified for the NCAA Division II Atlantic Regional this week at Diethrick Park. After Saturday’s performance, though, the North Carolina school is beginning to feel right at home. John Garcia collected three hits and drove in two runs; Landon Steiner had two hits, including a two-run home run; and Ivan Acuna added two hits, including a two-run double, to lead the Rams to a 10-8 victory over Millersville in a marathon losers’ bracket game. The victory, which improved the Rams’ record to 2-1 in the tournament and 37-18 overall, advanced them into another elimination game at 11 a.m. today against Shippensburg, which defeated Shepherd, 10-5, yesterday. Millersville, the 2016 national runner-up, finishes its season, 34-19. “Most of these guys, to be honest, probably haven’t been on too many winning teams before,” Ritsche said. “To come here and put pressure on them I think wouldn’t work, and so we kind of let them go out there and relax. The Rams scored in six of the nine innings against four Millersville pitchers, taking the lead for good in the third inning. Despite the fact yesterday’s game included 18 runs, 28 hits and 25 runners left on base; and seven pitchers who combined to 364 pitches over the course of four hours, Winston-Salem celebrated its second straight victory with plenty of energy to spare. Millersville was led by Chas McCormick who collected three hits, including a two-run triple, to break the PSAC career hits record with 305. Neff, Summerfield, Cain (two RBIs) and Ted Williams (double) added two hits apiece for the Marauders. Ben Snyder also had a double. While Millersville’s time in Jamestown is over, Winston-Salem doesn’t mind sticking around. NOTES: Will Beeson (5-1) was the winning pitcher and Kan Hironaka, who worked three innings and gave up one run on five hits, collected his first save. 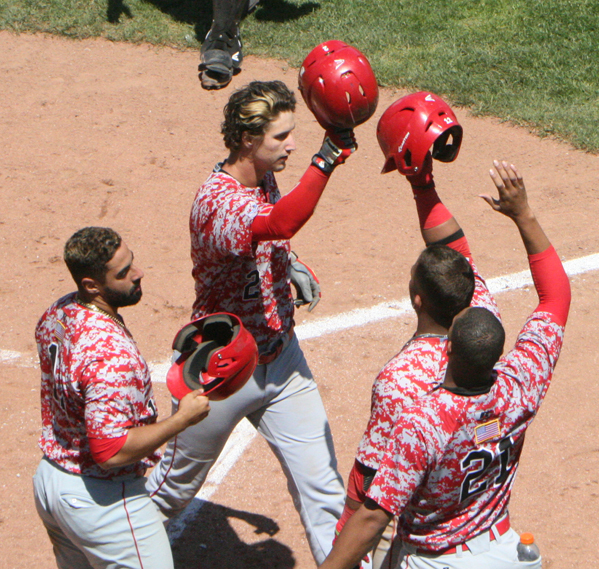 … Randy Norris and Brandon Ford each stole two bases, while Garcia and Randal Ortiz stole one apiece. … Tyler Yankosky (4-2), the starting pitcher, took the loss for the Marauders. 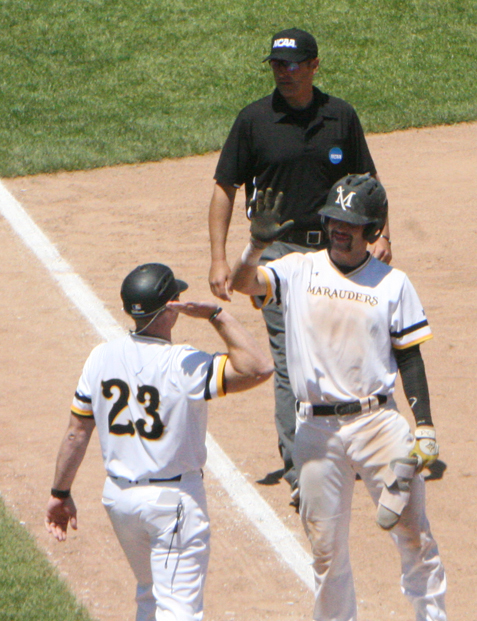 … McCormick stole two bases and Dan Neff had one for Millersville.